We decided to have a look at and do a pizza stone review after reading that many people use them for their home made pizzas and were very happy with the results. Let’s get started with our reviews. The used material Thermarite absorbs more moisture according to the specs we read. This stone is approve in the European union and by the FDA. The stone can be use in the oven or on the grill and it is becoming very popular to use the gas or charcoal grill for pizza lately. One of the big advantages is that this stone can withstand temperature shocks. No worry to take it out of a hot oven and rinse it of with cold water. The used material is a mix of many material, mainly cordierite. We found over 230 reviews and it received an average of 4.9 stars out of 5. The highest rating we could find for any pizza stone. After this it is easy to say that this is our most recommended pizza stone. 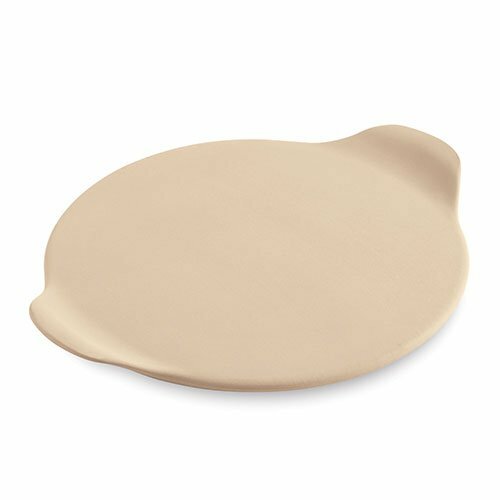 Although receiving a little lower rating this pizza stone from Pizzacraft is the number one seller in the largest online store. This is a large pizza stone and like we mentioned it measures 20 x 13.5 inches and this is roughly 270 square inches and will give you the opportunity to make a large whole family pizza. With a 4.3 star rating from over 400 buyers this is our second recommendation and our number one recommendation for a rectangular pizza stone. This stone is actually 22.5 inches long. Check your oven if it will fit. It is recommended to prepare your stone by heating up the oven to 500 degrees and heat the stone first by itself before using it for pizza. After making pizza let it cool of and rinse with cold water and a brush after scraping the crumbs of with a spatula. Some negative reviews were about the stone smoking and smelling even after several times of using it. Try it as soon as you receive it and send it back if this happens is my recommendation. A natural material including cordoriete can not always be predicted how it works. 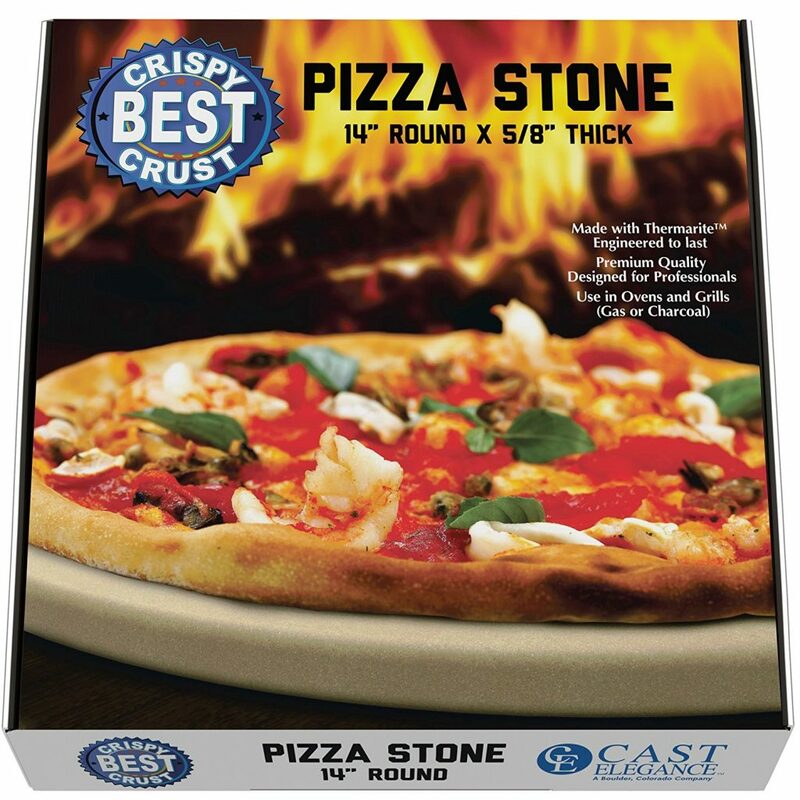 The old stone oven 16 inch round pizza stone is another highly rated pizza bake stone. 16 inch is the size of a family size pizza and makes this stone great for that purpose. Store bought or home made can be baked on this pizza stone. This stone is engineered to keep the heat more in the middle to prevent that soggy middle of the pizza effect you sometimes see. The used material makes it able to withstand high temperatures and it has no problem with temperature changes and will not crack. Some lower rating said it came cracked but only a few and this must be a shipping problem. Several people mentioned that they put a frozen pizza straight from the freezer on the pre heated stone and it came out perfect. Like any pizza stone some of them smell the firs couple of times when they are heated up. Most of the time this will go away very fast. TIP! Find the best price here! The Emile Henry is made in France and is a very popular brand that receives great customer reviews in general. They are a little higher priced but of a great quality. They are made from all natural materials and glazed in the colors black, granite, red and grey. The glaze makes them dishwasher safe and very easy to clean. Although it says 14 inch it actual size is 14.5 inch and with the handles even 17 inch. Lets have a look at the lower rating and what they say. Some or maybe most of the few that left a lower rating mentioned that the stone is a little fragile. But on the other hand the higher rating mention it is very sturdy. Guess since it is all natural materials that this one of the thing you have to test right away and in case of even a little doubt send it back. Arrived damaged was the second one that showed up a few times. Must be a shipping issue since most of them arrived in perfect shape. We found 91% 3,4 and 5 star ratings. This means that the few lower rating must be seen as like with any product that the perfect product does not excist. 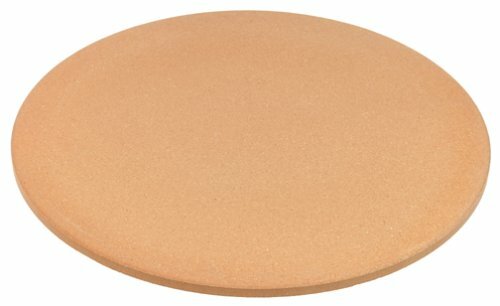 Pampered chef is a brand that many people look for in their search for a pizza stone and we fount that this can be a good choice after reading a lot of the reviews. We found the two most popular Pampered Chef pizza stones. The size is approximately but is not far of. The stoneware distributes the heat very evenly and draws moisture away. The few lower ratings mentioned it broke in two very fast after using it for the firs time. We found 91% 4 and 5 star ratings for the Pampered Chef pizza stone on average. This stone is not for use on the grill like some other stones are suited for both oven and grill. TIP! Best sale price? Click here! Not a lot of information to be found online but what we found was pretty good. 4.5 stars average from a little over 80 people we found so far. The size is 13 inch round but with the handles it is 18 inches. Some people did not like the handles because the used a pizza peel and the peel was to big to fit in between the handles. many people mentioned that they have had their Pampered Chef for a long time and use it without any problem. Easy to clean and very easy to use in most cases. A pizza stone or like some people call it a baking stone needs to be pre heated in the oven for at least 30 minutes and even longer for thicker crust pizza. Reason is that a wet stone will not work and neither does a cold stone. Pre heating will take care of both these problems. After that just slide your pizza on it and back till it is done the way you like it. flour the stone with cornmeal and the bottom of your prepared pizza well. This will prevent sticking and easy removal from the stone. Cleaning is easy but let the stone cool of first. Most of them can not handle the big change in temperature and will crack. Some brands offer stones that are capable of going for hot to cold without cracking. 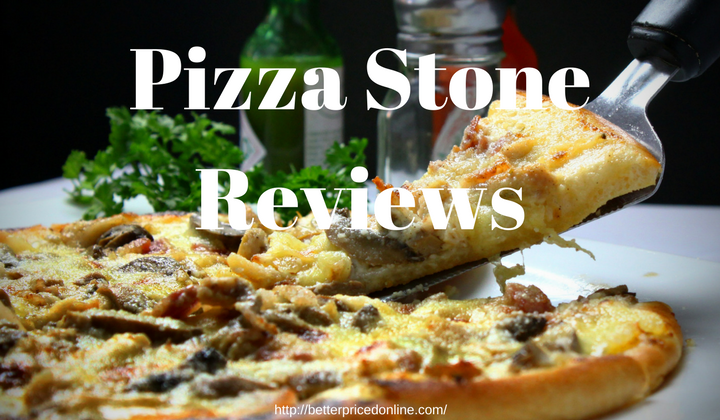 If that is what you need read our pizza stone reviews above since we looked a few of those. Never us dish-soap on a pizza stone. This will be absorb in the stone pores and makes it probably useless. Most pizza stones are made of clay or stone. 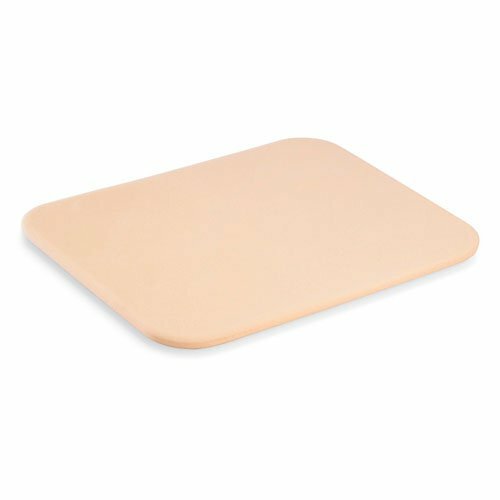 The classic pizza stone absorbs the moisture during the baking process of the pizza and the result is that you will end up with a crispier crust. There are many shapes and qualities to choose from.There are round pizza stones in a variety of diameters and there are rectangular shaped stones. If you like to be ready in one buy we recommend the pizza set that comes with the pizza peel. Some people prefer a different material and that is why we will also do a cast iron pizza pan review on its own page very soon. all together it is merely a personal preference and depends on you use. You need to get ready fast? Use a thinner stone. Need easier cleaning? Use a stone one. In my opinion the best pizza stone is made of clay since they come closest to the original pizza ovens used in the stone oven backed pizza restaurants.